This is a region rich in football history. Santa Marta soccer players have been a permanent fixture in the Colombian national team for decades. By far the most famous player from Santa Marta and, arguably, in the history of Colombian football is Carlos "El Pibe" Valderrama. Valderrama remains Colombia's most capped player with 111 appearances. He captained the Colombia national team during it's most successful period during the 1990s, appearing in the 1990, 1994 and 1998 world cups. He was renownd for his excellent vision and passing and created a huge number of goal assists despite not being a prolific goalscorer himself. Valderrama's 21 year career, which included spells in France, Spain and USA, began at his local Santa Marta club Union Magdalena. 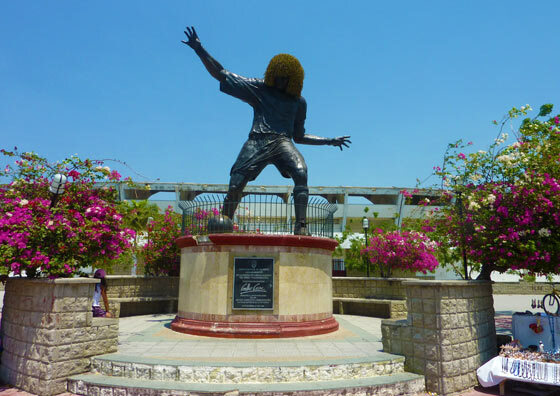 In 2002 a staute of the great Valderrama was unveiled outside the Eduardo Santos Stadium where Union Magdalena play their home matches. The statue includes Valderrama's characteristic blonde permed hair. Another great player who hailed from Santa Marta was Antony de Avila. His extraordinary career spanned 27 years. He became a legend at America de Cali where he won an unprecedented 8 titles. He also made 53 appearances for the Colombian national football team. He finally retired in 2009 at the remarkable age of 46. These days Union Magdalena play their football in Division B since being relegated from the top flight in 2005. Their only championship came in 1968. They have a fierce rivalry with neighbours Junior of Barranquilla. Union Magdalena have been somewhat overshadowed by Junior in the last few decades, but passions run high on both sides whnever the two sides meet. 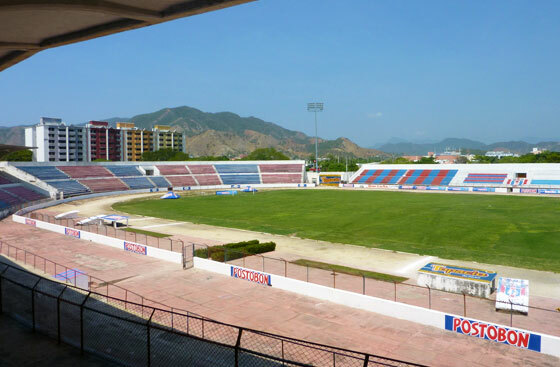 The Eduardo Santos stadium is located in the east of the city of Santa Marta. A taxi ride there from the beach area will cost about $4,000 pesos. Matches usually take place on Saturday or Sunday afternoons.